The December 2013 recent addition of the Mouth Collection has a video clip that documents the social interaction between a candy cigarette and me. My childhood memories of the sugary substance that creates a puff of pretend smoke interrupted the process of visually presenting this ephemeral act. I have not consumed candy cigarettes since elementary school age. 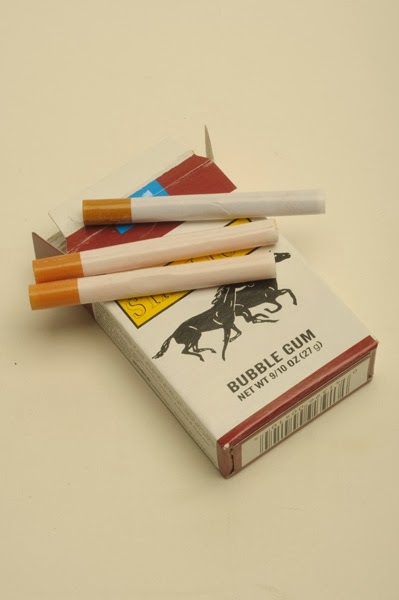 In considering the social engagement with the candy as part of the collection, I went by my childhood memories of blowing through the paper wrapper and the sugary coating on the gum produced an impressive puff of pretend smoke. With the understanding that memories can be a little skewed, especially from childhood, the present experience was not what my memory led me to believe. My intent to bring this experience with memory into my research is acknowledging the tension from the expectation of a memory and the present moment of a social interaction with an object. These expectations made me change the background from white to black for the restaging of the video process. This was done in anticipation to capture the pretend smoke in the moment. The black background does benefit in visually presenting the subtleness of the pretend smoke. Included in this blog post is a video used as research depicting outtakes from the documenting process. Between each video clip I have inserted selected text representing my thought process, while encountering the tensions from my memory and the present moment. I chose text over audio in this video as research, because I perceive memories and thoughts to derive from an individual context and relate to quiet moments. While there is no presence of memory studies or phenomenology included in this text, the blog post and video as research notates an increase tension with the past and present social engagement with an object for this particular video clip in the collection project. I have had interactions in the past with objects I have used as a child that were reintroduced to me as an adult for this project. One example is the chew gum clip from the December 2011 recent addition of the Mouth Collection. The one difference between the two processes is I had a memory of a specific visual that an action produced and with the gum I had to practice in order to perform the act of blowing bubbles. The video that was meant to accompany this post will be posted at a future date on a separate post, because of current and constant error messages on blogger.